Oratile Makgala (extreme right) with student volunteers at the General Careers Fair. Students should “get out there” and not just rely on opportunities presented by the university, Makgala says. 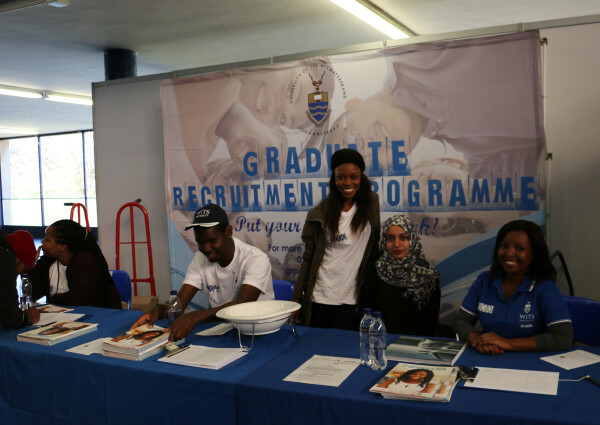 Wits students have been presented with opportunities to work overseas.at the General Careers Fair hosted by the Wits Graduate Recruitment and Employability Awareness Programme (GRP) on Tuesday, May 16. Students filled the Old Mutual Sports Hall where companies were looking for third or final year students who are about to go into the job market. According to legal counsel for Heineken SA, Kedibone Molefi, the company was looking for “young, passionate and energetic” students who want to make an international impact. The company offers internships in four sectors: finance, human resources, sales and engineering. Molefi also said that they were in the process of getting students involved in the Global Heineken SA Programme which will give students opportunities to work abroad. Another company offering prospects of working abroad was Kimberly Clark. Petros Sithole, a representative from the company’s human resources department, said the company offers a two-year graduate programme that caters for engineering, marketing and human resources students. Ntanganedzeni Tshinavhe, second year BSc (Electrical Engineering), said she had gone to the fair hoping that there would be more bursaries and vacation work opportunities. The GRP offers other services that assist students to prepare for life after graduation. An intern at the programme, Oratile Makgala, said the programme caters for the different faculties at the university through seminars and presentations.Makgala also advised students to “get out there” and not only rely on the opportunities presented by the university.